This is a beautiful case study resembling positive approach of the team towards finding solution. High Frequency of Cell and heater failure. Frequent chocking of cell assembly. High time required for cleaning and cell replacement. The team took up the challenge to come out of the issue. The study done was a good example of usage of various reliability tools like RCA, Fishbone diagram, Brainstorming, etc. ,there is another angle to it, ie. Lean Management. The main objective of the study was to reduce the quantity of jobs performed on the analyser. The team has recently gone through “7 Wastes-Mr. TIMWOOD “. They decided to identify the wastes in the activities on the analyser. All the activities were identified & written. Each activity was studied and type wastes were identified. Transportation of probe to the repair location: Can the probe be repaired at the installed location? Motion of the workmen for steaming, hammering & temporarily electrical connections: Why Steaming, Hammering is required? Why temporarily connections are required? Defect during leak checking: What is the procedure for ensuring correct assembly? Inventory: How to reduce inventory required supporting the frequent maintenance? Waiting: Why can’t the warm up done at location? 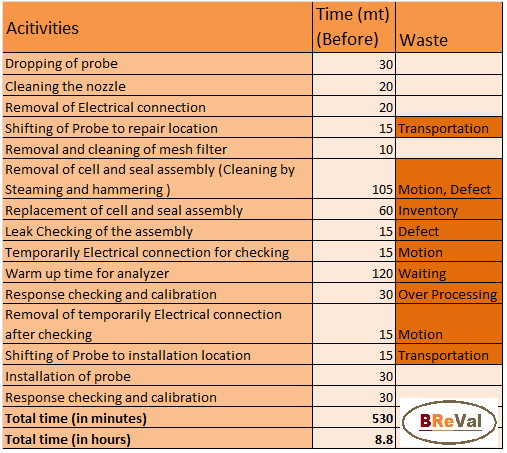 Over Processing: Why calibration & response check is required two times? The next step was to find answer to these questions. 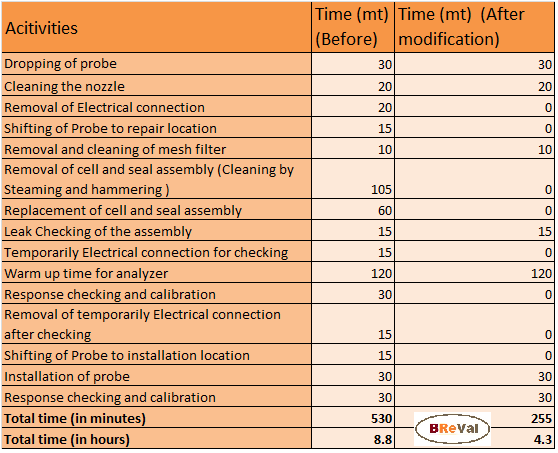 The maximum time was consumed by removal of Cell & seal assembly. RCA tool, Why Why analysis was used to drill down to accumulation of the acidic dust at the cell as the root cause. A ceramic diffuser was prepared with OEM, to put in place of mesh, which is more capable of filtering dust. This small change after value engineering has resulted in substantial improvement in terms of time, cost, inventory, maintenance frequency, reliability & availability of the instrument. Total time of job was reduced from 8.8 hours to 4.3 hours. No. of jobs reduced from 10/year to 4/year. Material cost reduced from Rs. 1.8 Lakh to Zero. Experience of industries has been concentrated in different quality, Reliability & Lean tools. Correct knowledge & implementation of these tools is necessary for best results. Check other case studies on Vanilla Ice Cream and Flight 5390 failure. Airway is the safest ways of transport in today’s world. This has been achieved by continual improvement by way of analyzing failures & putting strict compliance to findings. This is dedication of airlines & related agencies to work for safety of the passengers. The incident on British airways flight 5390 is an example of how meticulously the investigation had been done. Root Cause Analysis is not to find who did it, but why it was done. Near crash of British air ways flight 5390 from Birmingham to Spain. Wind Shield blown out & the chief pilot got sucked outside the cockpit at an altitude of 17300 feet. British airways flight 5390 took off from Birmingham airport to Spain on 10-June,1990. Couple of minutes after take-off, the wind screen got blown away. The vacuum generated, sucked the pilot outside the cockpit. His legs remain stuck inside cockpit. The crew had to hold on his legs, otherwise, his body, if released can flew into the engine, thereby taking down the plane. The Co-pilot took control of the situation & landed the plane safely on Southampton airport safely after 22 minutes in air. All persons on board was saved. The chief pilot immediately sent to hospitals, he had few fractures & mental trauma. Luckily, he could recover & managed to fly after 5 months. 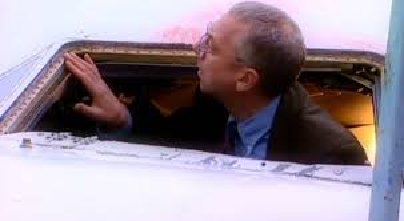 The investigating officer collected all the evidence from the plane first hand. He found that the wind screen was fitted from outside the cockpit. Few of the bolts were missing. He took samples of installed bolts. As per maintenance history, the wind screen was replaced a night before. 1. The technician was very experienced & has over confidence. 2. He matched the removed bolts, but did not refer the catalogue for correct size. 3. The size of bolts used was one unit smaller then recommended. 4. He was not having proper approach while fixing the windscreen & has to lean in awkward position. 5. He was having time pressure to fix the windscreen as the flight was scheduled for flight tomorrow morning. 6. There was no other engineer/supervisor to verify his job. As the plane achieves an altitude, there is difference in pressure inside & outside the cockpit. The windscreen was fitted from outside the cockpit and thus had to work against this pressure. During investigation, it was found that the bolts used was a size smaller that the correct size. As differential pressure increased, the bolts could not hold on & started giving away. The wind screen got blown out. Further, investigation found that the removed bolts were also of wrong size. The technician tried to found a match with removed bolts without referring catalogue. a. The Wind screen was fitted from outside as per design. Thus has to work against vacuum. The design was not adequate. a. The Technician did not refer catalogue and believed his knowledge. b. The Technician continued to work in awkward position & had not firm grip on screw driver. a. The job done was not verified by second person, being of critical nature. There is always a system factor behind every incident or a near miss. Probability of occurrence of this incident would have been minimized, if the wind screen had been fitted from inside. Also, If the airlines have redundant system check in place for critical jobs done on aircraft, this error would have been caught beforehand. Go through an amazing piece of case study of root cause analysis, how a Pontiac car owner surfaced an interesting issue which is hard to believe. ‘This is the second time I have written to you, and I don’t blame you for not answering me, because I sounded crazy, but it is a fact that we have a tradition in our family of Ice-Cream for dessert after dinner each night, but the kind of ice cream varies so, every night, after we’ve eaten, the whole family votes on which kind of ice cream we should have and I drive down to the store to get it. It’s also a fact that I recently purchased a new Pontiac and since then my trips to the store have created a problem…. You see, every time I buy a vanilla ice-cream, when I start back from the store my car won’t start. If I get any other kind of ice cream, the car starts just fine. I want you to know I’m serious about this question, no matter how silly it sounds “What is there about a Pontiac that makes it not start when I get vanilla ice cream, and easy to start whenever I get any other kind?” The Pontiac President was understandably sceptical about the letter, but sent an Engineer to check it out anyway. The latter was surprised to be greeted by a successful, obviously well-educated man in a fine neighbourhood. He had arranged to meet the man just after dinner time, so the two hopped into the car and drove to the ice cream store. It was vanilla ice cream that night and, sure enough, after they came back to the car, it wouldn’t start. In a short time, he had a clue: the man took less time to buy vanilla than any other flavor. Why? The answer was in the layout of the store. Vanilla, being the most popular flavor, was in a separate case at the front of the store for quick pick up. All the other flavors were kept in the back of the store at a different counter where it took considerably longer to check out the flavor. The problems may sound crazy sometime. There is always a systematic approach for geting to the root cause. The engineer first off all, did believe that there is some technical reason behind the Pontiac getting stopped every time vanilla is bought. He collected every data. He tried to find pattern & found one. He then related the pattern with probable technical issue & reached root cause. We in daily life, are facing such issues & had become use to it. Improvement start, if we do not accept these issues & work dedicatedly and systematically for digging out the root cause. After years of experience, numerous RCA (Root Cause Analysis) & reliability tools have been developed and are available openly. We aim to provide expert solution for helping out our business partners for long term solution.